Fraser and Neave, Limited engages in the food and beverage, and publishing and printing businesses in Singapore, Malaysia, Myanmar, Brunei, Thailand, Vietnam, Indonesia, China, India, Australia, Europe, and the United States. The company operates through Beverages, Dairies, Printing and Publishing, and Others segments. It produces and sells beverages, including 100PLUS isotonic drinks, F&N NUTRISOY soya milk, F&N sparkling drinks, F&N ICE MOUNTAIN bottled water, F&N NUTRIWELL Asian drinks, F&N SEASONS Asian drinks and fruit teas, F&N FRUIT TREE juice drinks, and F&N cordials. The company also provides dairy products comprising sweetened condensed milk, evaporated milk, pasteurized milk and tea, UHT milk, juices, yoghurt, and ice cream primarily under the F&N MAGNOLIA, F&N, FARMHOUSE, F&N DAISY, F&N FRUIT TREE FRESH, F&N NUTRITEA, F&N aLIVE, KING'S, and MEADOW GOLD brand names. In addition, it engages in the publishing, printing, distribution, and retail of books, trade directories and business information, magazines, home library reference books, and digital platforms; retail of stationery and periodicals; provision of commercial printing and packaging, and digital printing services; and property investment, development, and management activities. Further, the company distributes lifestyle accessories and storage products; offers treasury and financial services, technical application and brand marketing support services, and machine repairing services; operates vending machines; and organizes conventions/conferences, as well as E-retails products and services. The company was founded in 1883 and is headquartered in Singapore. Fraser and Neave, Limited is a subsidiary of TCC Assets Limited. inphyy Thai billionaire Charoen Sirivadhanabhakdi is looking to raise at least US$500 million ($640 million) by listing a hospitality trust in Singapore next year to help refinance some of the debt that his companies took on to win control of Fraser and Neave (F&N), people with knowledge of the matter said. 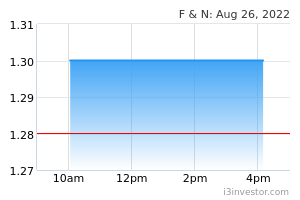 kongim61 F&N Price took a beating by dropping 15% off since Jan 2, 2014. On a annualised basis (sum of last 4 Quarter results , shows 5.7% growth rate. The price is now all time 3 years low since beginning 2012. All its peer like Dlady, Nestle, shows stable results. Last 3 Quarters results shows little negative growth in net profits. Be informed from a period of 27th Aug 2014 to 26 Sept 2014, Amanah Raya Trustte Bhd - Amanah Saham Bumiputrad has acquired 400, 000 units of F&N and disposed 100,000 units in 10 Oct 2014. Big Fish are playing with the price.